I would like to know if I can fix the axis from a Sprite group or all sprites at once. Example: my goal is align some chars at the same height on ground because some chars are on different axis height, some lower and other higher,but I wouldn't like to fix Sprite by Sprite. Does exist some command to fix a entire Sprite group or all of them at the same time? Last Edit: March 25, 2019, 03:35:03 am by Mazemerald. Re: Is it possible to fix the axis from entire group or everything? yeah fighter factory 3 can do this. You select the sprites you want, then put in the values to adjust it by. Make a back up first. I dont think you can hit undo. 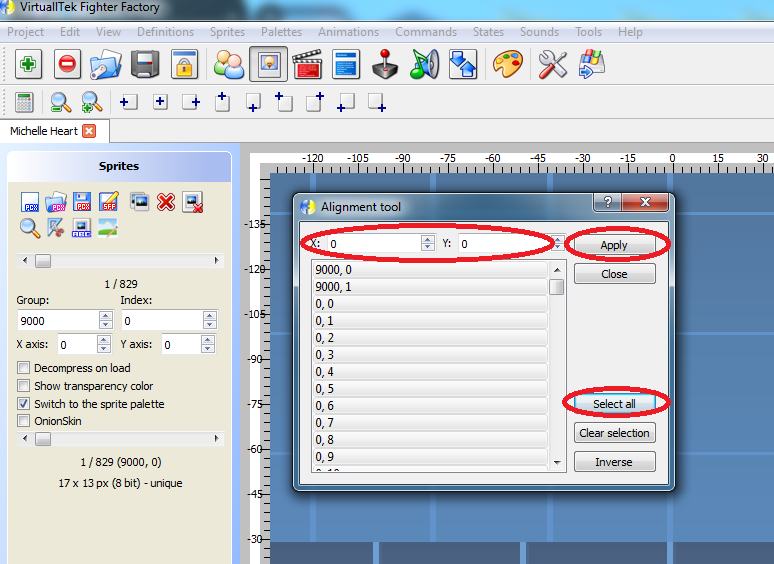 find the option alignment tool, open it. encuentre la opción herramienta de alineamiento, abrela. 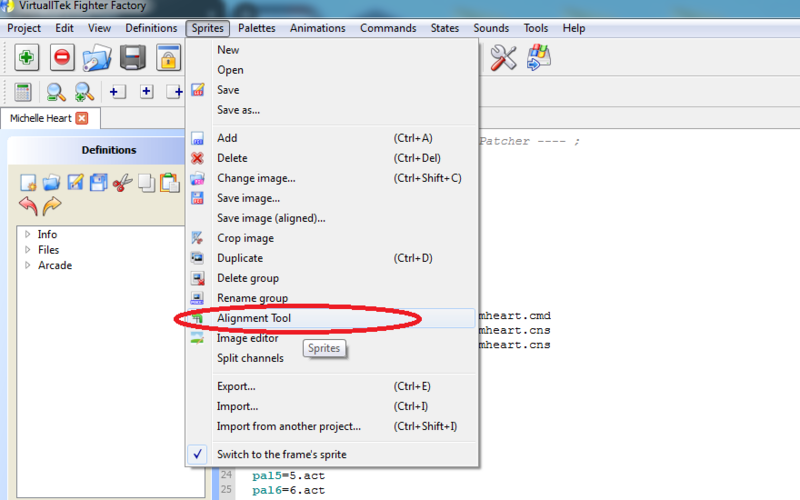 change the x and y values conform you need, select all sprites with the option select all and applying on them. don't forget to unmark the portraits numbers, because they won't need this alignment. cambia los valores de x e y conforme tu necesitas, selecciona a todos los sprites con la opción seleccionar a todos y aplica en todos ellos. no olvidate de desmarcar los numeros de los retratos, porque ellos no necesitán de alineamiento. One trick people might want to do if they need to move, say, 100+ sprites, but not ALL of the sprites in an SFF. Create a new blank character in FF3. Use Import from another project under Sprites. Import the ground of sprites you want. Then use the Align tool. This will allow you to move a big number of sprites without having to individually select them. You can use Shift to select a series of sprites, and ctrl to select multiple sprites, but if you need to move multiple groups, importing the groups into a new blank "char" works wonders.